Greg Smith Tells All – 60 Mins. 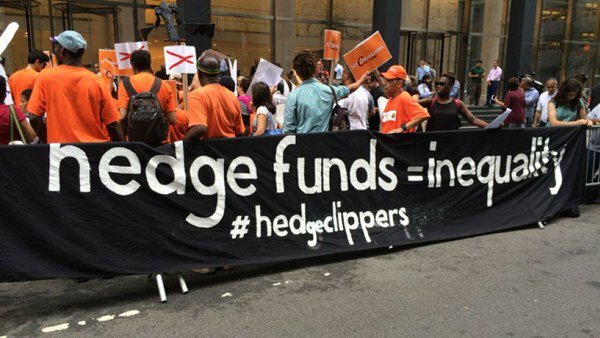 Hedge Funds Have Cost Workers Billions. This is How They’re Fighting Back. The number of complex investment tools has exploded over the last several decades. Hedge funds, which have skyrocketed since the 1990s, are one such tool. They’re called hedge funds—in the sense of hedging your bets—because, unlike more traditional investment options, they can bet against the market and, in theory, make profits even if stock prices are dropping across the board. This promise of a safeguard against the whims of the market is especially attractive to large, institutional investors, like public pension funds and university endowments—groups that want a steady rate of return. Not only has this promise proved false during bad times, but hedge funds have proved a mediocre investment during good times too. Poor returns combined with exorbitant fees have cost universities and public employees billions of dollars. In June, a vote to consider reducing allocations to hedge funds for the Ohio Public Employee Retirement System (OPERS) failed. OPERS is the largest institutionalinvestor in hedge funds in North America, and the fifth largest in the world. “An example of this is reflected in our hedge fund returns last year (2015) when we lost over $84 million and paid more than $133 million in fees…and this year we have not done much better,” he said. “So many of these hedge funders talk about how teachers should be accountablein their classrooms, despite not having adequate resources. Well then they should be held accountable for their performance too. I’m not sure you should only look at numbers, but even based on their own standards we should be divesting,” says Weingarten. Spencer McAvoy is an editorial intern at In These Times. He is a recent graduate from the University of Chicago with a degree in English and a member of The People’s Lobby.